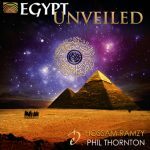 Following the huge success of the previous albums Eternal Egypt, Immortal Egypt and Enchanted Egypt, Phil Thornton and Hossam Ramzy present Egypt Unveiled, crowning the trilogy. A magnificent album, echoing the majesty of the pyramids, revealing the mystery of Egypt in a 21st century guise. Artist biographies and descriptions of the pieces in four languages. 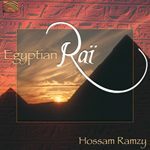 This is a SPECIAL EDITION, Come with an OUTER sleeve of the album cover which is only available from this site plus, each album you buy, can be autographed by Hossam upon request. • Playing Time: 66:54 min. Artistry such as this restores my faith in original new music releases. Exisiting fans will be thrilled by the varied journey this record takes us on. New listeners will be inspired to start collecting other works by Hossam. A very special album.